The anticipated new feature from renowned filmmaker Terrence Malick (Badlands, The Tree of Life), To the Wonder boldly and lyrically explores the complexities of love in all its forms. Parisian single mother Marina (Olga Kurylenko) and Midwestern tourist Neil (Ben Affleck) fall madly in love in France and relocate to Oklahoma with Marina's young daughter to start a life together. As their relationship wanes and her visa nears expiration, Marina makes the acquaintance of a priest and fellow exile (Javier Bardem) who is struggling with his faith, while Neil renews a relationship with his childhood sweetheart, Jane (Rachel McAdams). There is perhaps no greater mystery in the whole of human existence, than the origin and transience of love. As an emotion, it consumes us and inspires us, but its initial source and life expectancy always remain unknowable. Where does our spark of passion come from? Where does it go? And when it's gone, what takes its place? These are questions that have plagued our hearts for centuries, flooding our art with unapologetically romantic musings and sentimental odes, sappy love songs and melancholic exaltations of unbridled affection. As if in a dreamy whisper, Terrence Malick's 'To the Wonder' continues this never-ending line of questioning, gently pondering the mysteries of love and heartache through achingly beautiful sights and sounds. Stripped away of conventional narrative structure and dramatic beats, the film becomes a cinematic tone poem, emphasizing mood and abstract emotions in an attempt to express the inexpressible. The loose story follows a French woman, Marina (Olga Kurylenko), as she travels from Paris to the United States to live with her boyfriend, Neil (Ben Affleck). She also brings along her daughter, Tatiana (Tatiana Chiline), from a previous marriage, and together the pair attempt to readjust to American life. Though the couple's passions are initially strong, their relationship starts to strain. As their affections are tested, Marina must deal with oscillating waves of romance and despair, constantly overwhelmed by the irresistible pull of burgeoning love and repeatedly devastated by the cold indifference of its absence. Choosing to forgo typical structure, Malick's approach here is much more experimental and abstract in form, essentially building upon the same lyrical style he developed in his previous film, 'The Tree of Life.' To this end, dialogue and traditional exchanges between characters are sparse. Instead, most of the runtime is made up of soft spoken voiceover narration from the cast that plays out over imagery of their journeys, guiding us through the movie's major thematic beats with the rhythm of a filmic poem. With that said, there is still a clear story here, it's simply told in a different manner. Though they certainly have a role to play, this isn't a film about drama or conversations. This is a film about smaller nuances and deeper concepts, about the little details that rest between moments, about the joys and losses that lay hidden in the simplest of actions and images -- like the irresistible allure of a woman's lips, a playful promise locked away in a coy smile, the rhythmic flow of blonde hair caught in the wind, a seductive glance from a lover, or soft caresses on bare skin. Essentially a feature length montage of sumptuous imagery and philosophical ruminations, the movie traces the characters' existential crises through operatic crescendos both grand and subtle, literal and metaphoric. As Affleck himself points out in the included special features, through Malick's lens the film becomes a "memory of a life," dreamy and indistinct, but full of palpable emotion. There is a certain sense of unrestrained awe in the director's visual style, finding rapturous beauty in every inch of the film's free flowing compositions, gliding camera movements, and drifting rhythms. As if caught in a perpetual hypnotic ballet, the frame gently swoops and sways around its characters and locations. Shots spill into one another like a cascading stream of images, connecting little fragments of emotion and tone. As Malick's subjects dance and laugh and weep, so too, does his camera –- capturing its subject matter through a personifying lens. Breathtaking shots of nature are organically mixed with more humble sequences set among seemingly ordinary rooms and streets, always cast in the gentle sparkle of natural light. No matter what we're focused on, whether joyful or somber, there is a reverence in the camera's eyes. A reverence for love and hate, for people and places, for nature and man and how it all fits together –- a reverence... for all things. With that in mind, as joyous as the runtime can be, Malick does not shy away from the darker side of romance, gradually shifting the film's tone into gloomier territory. After all, in order to truly examine the concept of love, one most also take a look at its antithesis. There can be no passion without hate, no ecstasy without emptiness, and there are several truly somber passages that probe deep into the murky recesses of scorn, jealousy, infidelity, loneliness and slowly wilting affections. Complementing this multifaceted examination of love, is a subplot about a priest (Javier Bardem) experiencing a crisis of faith. These disparate concepts end up finding harmony with one another, drawing direct but appropriately ambiguous and open-ended parallels between love, human connection, god, and spirituality, in a manner that is never preachy or didactic. Instead, it feels honest, intimate, and universal. While Ben Affleck and Rachel McAdams might share the cover's spotlight, this is really Olga Kurylenko's film, and the Ukrainian born actress really rises up to the challenge, carrying the picture with an incandescent spark. Both solemn and wonderfully playful, her performance skirts between childlike excitement and reflective desperation. Whether giddily jumping on a bed, seductively waltzing through a field, or gravely submersing herself in a pool, the actress manages to say so much with little more than a glance or a smile. Even the very way she moves is perfectly in sync with Malick's camera, making it seem as if the two are merely an extension of one another. When the movie first premiered at the Venice Film Festival, it was actually met with boos (as well as cheers) from the audience. Likewise, its reaction among critics at the time of release was decidedly mixed and veering toward negative (it has a 42% on Rottentomatoes). While Malick's films can always be very divisive among audiences, I'm actually a bit surprised by this lukewarm critical reception, especially considering the strong positive reaction the similarly stylized 'Tree of Life' received. Still, I can understand some of the complaints and, while I admire it greatly, the film doesn't quite reach the same heights as the director's previous effort. Filled with all of Malick's trademark flourishes, there are times when the deliberate abstractions and existential voiceover musings become a little overblown, artificial, and borderline silly. Likewise, the movie examines many of the same themes found in 'The Tee of Life' and, coupled with its nearly identical aesthetic, the picture starts to feel a bit redundant, as if Malick is simply repeating himself with a slight variation on an older tune. The story itself is also exceedingly simple, and while the goals here aren't tied to traditional narrative, the plot and characters are all conveyed in very broad strokes. At its worst, the movie can play out like an overproduced perfume commercial, and at its best it's truly transcendent. In other words, it would be pretentious if it wasn't all so... beautiful. An exuberant and sorrowful examination of love as divinity, 'To the Wonder' is a visual poem full of passion and melancholy. Freed from the constraints of conventional storytelling, Malick evolves his own motion picture syntax, using the language of images to stimulate the mind and stir the soul. The experimental and ultimately oblique approach won't be for everyone, and there a times when the director's quirks do get a little excessive, but as a whole this is a genuinely breathtaking piece of filmmaking. Entrenched in a dreamy journey toward ever elusive wonder, Malick's film does not take place in our waking world. It's caught in a haze of memory and conjecture, cast in a perpetual magic hour, where the sun hangs still just below the horizon, stuck in a twilight that has no end, and an infinite dawn that's forever approaching. 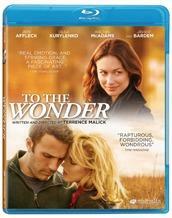 Magnolia Home Entertainment brings 'To the Wonder' to Blu-ray on a single BD-25 disc housed in a keepcase. Some skippable trailers play upon start up before the disc transitions to a standard menu. The packaging indicates that the release is Region A compatible. The film is presented in a 1080p AVC/MPEG-4 transfer in the 2.35:1 aspect ratio. Shot with a combination of 35mm and 65mm, the cinematography by Emmanuel Lubezki looks absolutely stunning, but there are some very minor imperfections with the technical presentation. The print is in pristine shape with a light, natural layer of grain. The dreamy, gliding photography comes through beautifully, with strong clarity and lovely saturation. Little details, like the way the sun reflects off of the ocean, or tiny grooves in wet, muddy sand, or delicate nuances in the actors' facial features, are all rendered wonderfully. Colors are gorgeous, offering pleasing dimension and pop. Stained glass windows, golden hair flowing in the wind, and vibrant flowers are all highlights, basking the screen in a mixture of subtle and bold hues. Contrast is high, with bright whites and, with the exception of a scene or two, deep, consistent blacks. Unfortunately, as gorgeous as the images are, the video does falter with some minor but noticeable signs of banding and faint compression. These issues aren't especially troublesome, but they do hold back the presentation, slightly lessening what could have been a truly exceptional transfer. As its title implies, 'To the Wonder' looks simply wondrous on Blu-ray. Rich and stirring, Malick's images are in a class of their own, and while the transfer is held back a bit by isolated artifacts, the overall video presentation is very strong. The movie is provided with an English DTS-HD MA 5.1 track. Optional English SDH and Spanish subtitles are also included. Subtle, nuanced, and utterly rapturous, the mix fully engrosses the audience in the film's delicate beauty. Dialogue and narration are clean and nicely balanced throughout, giving ample emphasis to all of the film's lyrical musings. Music selection plays a huge part in bolstering the movie's ethereal tone, and all of the classical and original compositions surround the audience from all sides with crisp fidelity and strong separation. Outside of the emotional score, the mix is home to a delicate sense of space and dimension, spreading subtle ambient effects like crickets, flowing winds, and falling rain across the soundstage. Key sounds are isolated and emphasized, like the rough and aggressive noise of a construction site or the playful environment of a carnival, elaborating on the narrative's deeper mood. Directionality and imaging are restrained but organic, sending specific effects, like a passing train across the room. Dynamic range is wide and free from distortion, allowing the music to swell to emotional crescendos. Bass activity is also strong in isolated sequences, stressing the power of raging waters and man-made machines. Full of subtle auditory dimension, this is a exceptional mix that fully immerses the listener in the movie's poetic rhythm. Though notoriously media shy director Terrence Malick is of course a no show, Magnolia has included a slim but decent assortment of featurettes. All of the supplements are presented in 1080p with Dolby Digital 2.0 sound and no subtitle options (unless noted otherwise). The Making of To the Wonder (HD, 10 min) – This is solid featurette with cast and crew interviews and behind the scenes footage. The participants discuss the lack of a formal script, the director's unique process and shooting methods, and how they worked to understand their characters. Details are also given on wardrobe choices, the film's use of natural lighting, and locations. The Actor's Experience (HD, 6 min) – This featurette elaborates on the actors' process. Though there are some repeated bits from the previous featurette, there are some new, worthwhile insights as well. The Ballet (HD, 6 min) – The film's improvisational shooting style is discussed in detail. Again, certain pieces are repeated from the Making Of doc. Local Flavor (HD, 5 min) – Bartlesville, Oklahoma, where the film was shot, is the focus here, addressing locations and the local communities involvement. Once again, certain insights are repeated from the main featurette, but there are new bits as well. Theatrical Trailer (HD, 2 min) - The film's trailer is presented with DTS-HD MA 5.1 sound. Also From Magnolia Home Entertainment (HD) - Additional trailers for other Magnolia release are included. Terrence Malick's 'To the Wonder' is a cinematic tone poem consumed with passion and despair. Through beautiful images and stirring music, the film mediates on the wonders and sorrows of love. Despite some minor artifacts, the video transfer is simply breathtaking, and the audio mix is exceptional. Supplements are a little redundant, but there are some welcome insights into the film's style and production. Malick's experimental and esoteric approach is divisive among audiences, but for those open to lyrical forms of filmmaking, this title is absolutely recommended.